With just a first name and an email address, you can enter to win a free handbag (totally free, no shipping, no credit card required) from HandbagPlanet.com. The site is promising high fashion, trendy handbags inspired by popular designer brands but priced reasonably (between $30 and $80). Sounds good to me, and I could always use a new handbag!! They are giving away a free handbag every hour for 24 hours until they officially launch. When you sign up you can choose WHICH handbag you would like to win. You get one entry for giving them your first name and email address, 3 more entries if you give them +3 friends’ email addresses, +10 more entries if you email them your Facebook, MySpace or Twitter account info, and +25 more entries if you write about the contest on your blog. Ahem, now you see why I wrote about this on my blog! I NEED a new purse and I’d love to snag myself a freebie from HandbagPlanet.com before they even launch their store. Not sure I’ll convert to calling it a handbag, but I’m willing to try if I end up winning one. Enter to Win a Handbag! 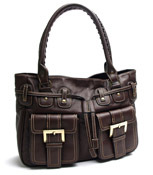 Handbag Planet’s Free Handbag Every Hour Official Rules. Thanks for blogging about our contest! We need all the publicity we can get for our upcoming site launch. Best of luck winning a handbag (or purse :-)! This is a great contest. I want em allllll!! Thanks for telling us about it. Muaaaaaaah,you da best! So – the handbag contest winners have been announced and guess what – I didn’t win. Doggoneit! I’ve been thinking I might peruse and purchase one (since I was all geared up to win one) – which I guess is the point of the contest now, isn’t it. They have a 20% coupon code going on ’til Saturday so maybe if I have time I’ll hop over and look today. If you’re interested – the coupon code is “LAUNCH” and it’s good until noon this Saturday (the 18th). I’m so bummmmmmmmed!! I was forced to go buy Milk Duds, Energy drinks and Milk Chocolate covered coffee beans as well as creamsicles to drown my sorrows. And i did all the shopping in my pajama’s. Now i can’t afford to use the code…….oh well, next time you just tell me and we’ll keep it a secret lol.